Positions are the key to unlocking the network of interdependent roles, teams, and organizations. They are the smallest unit parts of organizations, the jobs that people step into to play their part in the working network. People are independent, separate from the organizations they inhabit. People are part of their social networks of family and friends. People are born into families; positions are created by organizations. One person, one position: Two great human domains, Social and Organizational, are integrated in an occupied job. One position anchors four support functions: The occupied position interlocks Finance, HR, IT, and Facilities systems. Each position has a whole/part link of organizational membership: A position has one mutually-exclusive “paycheck” link connecting it to a nested hierarchy of budget rollup. One link, two roles: Each from-to directed link involves two positions, each with a complementary role in the relationship. 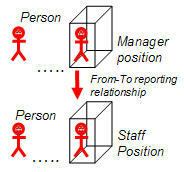 In the reporting relationship, for example, one is the manager role and the other is a staff role. One position, many roles, many teams: A position may play many parts in an organization, each in the context of a team of roles; a position's 1-degree of relationships is embedded in the organization as multiple roles played in multiple teams.